Today we’re excited to announce the release of MonsterInsights 7.5! This version is faster than ever, and comes with some new features to make your analytics more reliable and accurate than ever. Recently our dev team introduced a brand-new settings panel that was much simpler and easier to use. It was also much faster, because our dev team used Vue.js programming language which offers significant performance improvements. Our users loved the speed improvements so much that with this latest release, we’ve rolled them out to the entire MonsterInsights plugin. That’s right – with MonsterInsights 7.5, you’ll notice that EVERYTHING is faster. That includes all your favorite reports, plus the Google Analytics dashboard widget. Now you can instantly view all your important metrics right on your dashboard, faster than ever. Do you make money from your blog using ThirstyAffiliates? We’ve just made affiliate link tracking in WordPress a whole lot easier for you. Now there’s no need to configure any settings to track your ThirstyAffiliate links. MonsterInsights will detect if you’re using ThirstyAffiliates and automatically tracks all your affiliate links, no matter what link prefix you’re using. This will save you time and also reduce the possibility of any errors messing up your tracking. Do you have a blog and an ecommerce shop on separate domains, or maybe a main business website and your blog? If you do, you know that getting real, useful analytics to base your business decisions on can be hard. What if someone reads a few posts on your website, then browses your ecommerce store, then returns to your blog? If your website and store are on different domains (myblog.com vs. mystore.com), then that user will be counted 3 times! The answer to this is cross-domain tracking, which tracks a user across multiple domains and counts it as a single session. But up until now, setting up cross-domain tracking hasn’t been easy. You had to create some custom tracking code with Google Analytics, which is tricky to do (especially if you’re not a developer). Creating this custom code the right way can be very difficult, and we often see errors in this code which can mess up your analytics. But with MonsterInsights 7.5, we’ve solved that problem for you. Now you can easily track sessions multiple domains just by typing your domain in your MonsterInsights settings. That’s right – no code needed! We’ll take care of the coding for you and track it automatically. Already have cross-domain tracking set up? 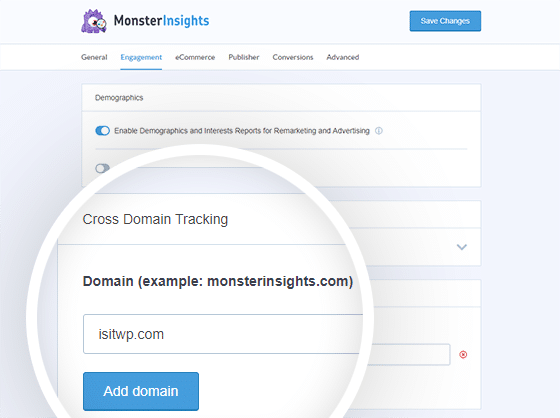 Now MonsterInsights will automatically detect your cross-domain tracking code for you, and add it to your MonsterInsights settings instead. PLUS, MonsterInsights can automatically detect and fix the most common errors in cross-domain tracking code, so you can get the accurate, reliable analytics you need for your business. Want to unlock all these features yourself and get access to more reliable and accurate analytics, right in your WordPress dashboard? Click here to get started today. Stay tuned, because we have a lot more exciting features in the works that we can’t wait to share with you soon. As always, thank you for continued support of MonsterInsights. We look forward to continue making analytics easy for you!